Looking for Eco-Friendly Solutions for Packing Lunches? 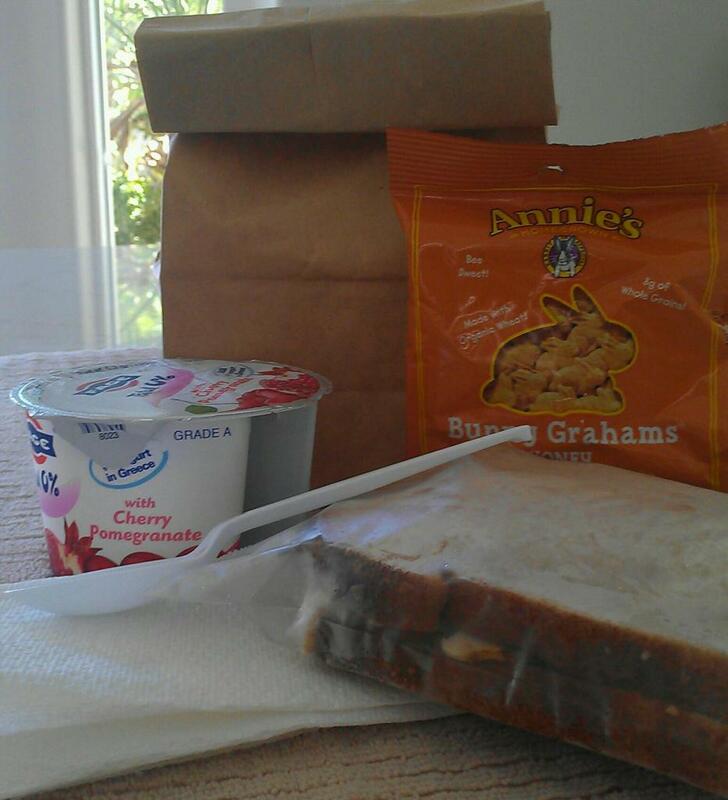 Are you still using disposable brown paper lunch bags and plastic utensils, containers, and baggies to pack your lunch? Discover eco-friendly alternatives that will save your family over $400 each year. My kids just returned to school. Yay! So now it’s all about packing lunches again. Making healthy and good quality homemade lunches that the kids will actually eat is always a challenge, but so is finding a decent way to pack them that’s economical, eco-friendly, and effective. I hate to admit this, but my family needs to be greener when it comes to packing lunches. Sometimes we go through boxes of plastic bags like tissue! And after reading stats from this infographic, I realized we’re wasting money. 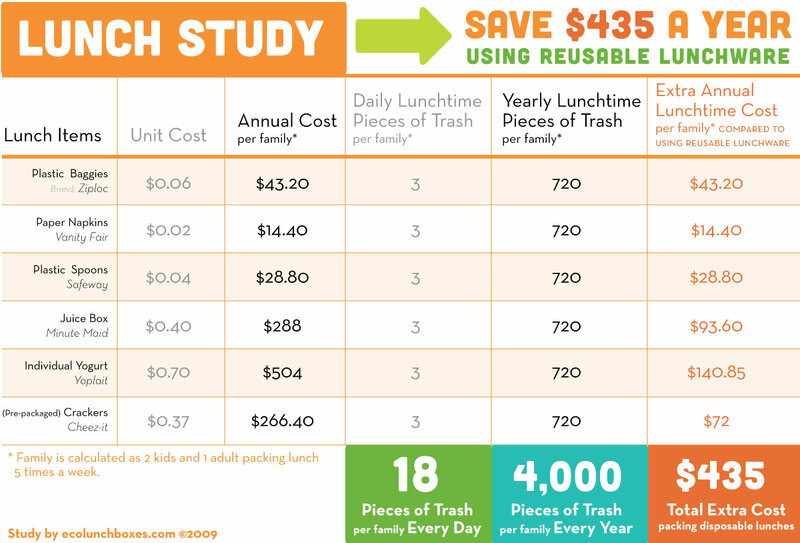 We could easily save over $400 a year by just using non-disposable lunchware! That’s really significant. Of course, there’s the initial investment, but once they’re purchased, they last several years. So this school year, I thought it was high time to check out some environmentally friendly lunch packing solutions to keep sandwiches in tact and fruit from getting smashed. Something that could be easily washed in the dishwasher without fear of it melting. Something that was “cool enough” for my teens to carry — not an easy task. And something that was definitely kind to the earth. I got down to doing some research and found plenty of eco-friendly containers, lunch bags, and more. It was a little overwhelming, really. But some seemed a little better than others and the prices varied quite a bit. After sorting through several brands, I thought I’d share with you what I found. Which ones could you see working for you? Somehow zip lock bags don’t always cut it. Food sometimes gets “forgotten” about and smashed at the bottom of backpacks or briefcases. Think PB&J sandwiches flat as pancakes and crackers reduced to crumbs, or — and this is one of my favorite “backpack food finds” — grapes so crushed to a pulp that they have started to ferment and smell like wine. Yucky, right?! Plastic containers aren’t much better. They’re not green or dishwasher friendly. Plus, the plastic can break down over time and get in your food. I’ve also found they leak sometimes. Each of these cute little stainless steel containers measure 2.2 x 1.8 inches and hold 4 ounces. The perfect size for healthy little snacks! A set of 3 is available for $17.82 from Amazon . This ingeniously designed 8 oz. snack container made out of silicone can easily be stored in the freezer or heated in the microwave. When it’s empty, it collapses. So that means easy storage and less backpack space taken up when lunch’s done. Available from Amazon for $15.26 or Abe’s Market for $9.95 each. Finally an eco-friendly solution for condiments, dips, nuts, and salad dressings! A set of three 1.5 ounce stainless steel containers has silicone lining to stop leaks from happening. Available from Amazon for $20.99. Are you a sandwich lover? Then this is the perfect container to protect your sandwich and keep it fresh! Available from Amazon for $14.95 each. For the traditionalist, this is the perfect solution. A reusable, tear-proof “brown paper” bag that’s leak resistant and insulated. Available from Amazon for $19.95. Made for the minimalist, this washable canvas bag is the perfect solution. Too plain for you? Try personalizing it with fabric paints . Available from Amazon for just under $8. These cute organic cotton lunch bags from Fluf are available in several colors and fun designs, such as a penguin, dinosaur, British flag and more. They snap shut for easy closure and are 11 x 8 x 4.5 inches. Available from Amazon for $19.50. This smart-looking, three-in-one stainless steel bento set measures when closed, 4 inches wide, 5 1/2 inches long and 2 3/4 inches high, so it can easily tuck into backpacks. It’s leak-proof and has three food compartments that will work for anything from sandwiches to pasta to applesauce. Very versatile indeed and great for kids, tweens, teens, and adults alike! Price: $26 to $32.99 depending on where it’s purchased. Available from Abe’s Market and Amazon. This clever lunch box collapses to 1/3 it’s size and is made from food grade silicone and biodegradable Eco Plastic. A handy spork easily stores into the lid. Available in four colors – blue, green, orange, and purple. The large size measures 7.1 x 1.2 x 9.8 inches and the small one is 6 x 1.2 x 7.2 inches. At only $9.99 from Amazon it’s definitely one of the better priced green alternatives. This stainless steel lunchbox is ideal for those who want something a little smaller. Measuring in at just 6.5″ x 4.5″ x 1.85″ it’s a great solution. Plus, it’s a steal at $11.99 from Amazon. Last, but not least, is washable and reusable flatware. Otherwise, how can you eat a salad or an entree, such as an Asian noodle dish, on the go? Most of what I found was made in Asia, which means you not only get a fork, knife, and spoon, but chopsticks, too! Check ’em out! This handsome set is made of sustainable bamboo and the holder is made of RePET — i.e., recycled plastic bottles. Available in 10 delicious culinary colors from avocado to merlot, you can find in on Amazon for just $12.95. Hand washing is recommended because it’s finished with oils, but you can still put it in the dishwasher! Stainless steel more your speed? Check out this stainless steel lunch utensil that includes a fork, spoon, and chopsticks. Available in four amazing colors from Amazon for just $8. I love the little containers for sandwiches, as soon as I started reading your article, I kept thinking about my school lunches from years ago. They consisted mostly of a very thin (because it got squashed in my bag) cheese and gherkin sandwich, in a little plastic bag. I think I mostly threw it out and ate my apple for lunch. Preparing school lunches was hard for me too, for my children – these containers will make it much easier for parents because there’s more choice of food if you have decent containers to put it in. Good point, Julianne. Kids won’t have a need to throw away food because it won’t get squashed with these handy little containers. By the way, I too remember times when my lunch sandwiches got smashed flat as pancakes in the plastic baggies they were packed in! Definitely not appetizing. I also like that stainless steel option. I did not know they made those. Saving $400 a year is quite a bit of savings.over a period of a year and if you think even longer term is is an astounding amount of money. Thank you for sharing. I knew you’d spot how economical the eco-friendly lunch packing solutions are! I realized that over the course of my children’s school years, thousands could have been saved if I had started when they were much younger using green lunch boxes, containers, and more. Problem is good quality and safe solutions weren’t always available back then. Plastic containers that leached toxins ruled years ago! Considering kids are in school at least 13 years (K – 12th grade), savings could amount to about $4200. A substantial amount that may better be used towards their college fund — or if you’re doing it for yourself, maybe a nice vacation! I like the stainless options as well as the collapsible container. I love the eco-friendly cutlery . . . with that the issue is always the possibility of them being lost or accidentally thrown out. Great options, though. I love the green choices rather than all the plastic and waste. Leanne Chesser recently posted…Do You Listen to Your Intuition? Hi Leanne. We’ve got a few of the stainless steel containers and they really are nice. They’re easy to keep clean as we just wash them in the dishwasher. Good point about the cutlery. I could easily see my kids accidentally tossing them in the trash or losing them at school! So, what I do for now is give them cutlery from an old set of silverware. That way if they lose it, it’s not a huge loss.